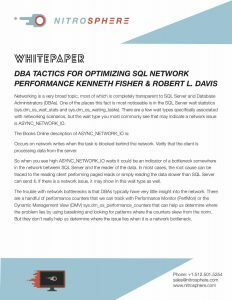 Many companies have either in-house or packaged applications that were developed with a client-server (2-tiered) architecture. 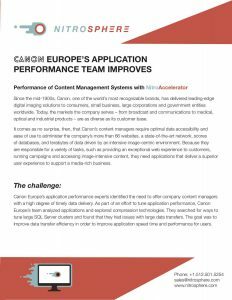 These applications worked fine when everyone was at the same location, but as a company expands with more dispersed operations including international locations, remote branches and mobile users, performance can slow to a crawl. 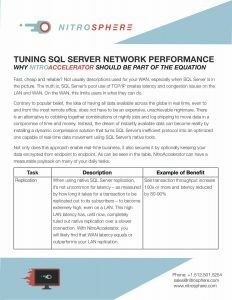 Many client-server applications were just not designed to be run across connections where the bandwidth varies per client connection. Move to Virtual Desktop Infrastructure (VDI, Terminal Services) such as Citrix and Microsoft provide – This is not how the applications were designed to run and is more expensive than many think (see this interesting article on the cost of VDI. And end-users tend to really dislike VDI. Install WAN accelerators such as from Riverbed – These are great if you have six months and potentially hundreds of thousands of dollars. It’s also like using a sledgehammer to do a screwdriver’s job. Here is an article by Pinal Dave on that very subject. Add more bandwidth – Now you are adding additional recurring monthly costs for each site and more bandwidth is not always available. What happens to remote or mobile users? The Nitrosphere difference is that we are a software solution that installs on the server and on any clients with slow connections connecting to the server. No restart of the server is required and the install takes seconds. 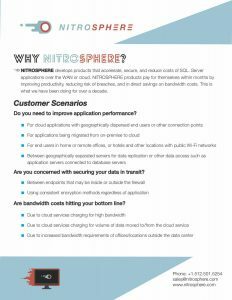 Nitrosphere provides fast, secure, simple solutions to application performance issues caused by the network.